President Muhammadu Buhari has said it is not true that his government has been marginalising Igbo people. He also assured the Igbo of a seaport in Onitsha if re-elected. The President added that his appointment of security chiefs was based on merit not sentiments. “The present Chief of Army Staff, the Chief of Air Staff, the Chief of Naval Staff even the previous Inspector-General of Police that just left, I didn’t know them personally before I appointed them. I follow the records,” the President said. He said even the current acting Inspector-General of Police, Abubakar Adamu, was appointed based on merit. “The same thing with the IG that was appointed last week. I don’t think I have ever seen him, I follow the records. So, appointments in the Armed Forces and other law enforcement agencies depend on individual performance after recruitment, not where you think you come from. At least between me and God, this is what I do. “I assure the people of the South-East of the completion of the ongoing roads and rail projects in the geopolitical zone in my second term. 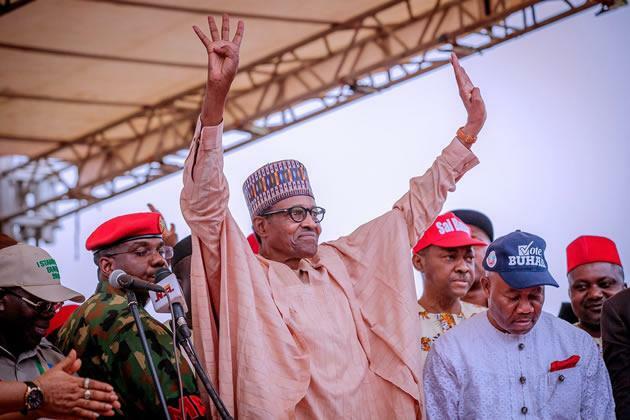 Buhari said his party had kept faith with its campaign promises on security, economy, and anti-corruption fight. “I stand here to thank you for coming out in your numbers to receive us despite the scorching sun. “We urge you to vote for the APC from top to bottom, and we promise not to disappoint you. Our second term will be full of roses for the people of the South-East,” Buhari said. On his part, the National Chairman of the APC, Adams Oshiomhole, said the people of the zone should not allow themselves to be deceived again by the opposition. Earlier at the inauguration of the Zik Mausoleum and Conference Centre in Onitsha, Buhari extolled the virtues of the first President of the country, the late Dr Nnamdi Azikiwe, saying the late sage would continue to be alive in the minds of Nigerians, including those yet unborn. Speaking in Enugu, the President pointed out that the Minister of Transportation, Rotimi Amaechi, had promised the people that the Federal Government would construct a railway to link the South-East zone. He, however, said as Amaechi made the promise without the approval of the Federal Executive Council, noting that it might be hard to convince FEC to approve the project he would do his best to convince FEC for the approval.